Providing you the best range of footwear adhesives with effective & timely delivery. 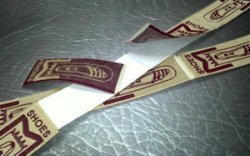 Our organization provides an advanced range of Footwear Adhesives to our clients. These are fabricated under the guidance of our experts by usage of best quality materials. Our products are preferred for its fast and convenient sealing, suitable for any type of footwear and also for its promptness and reliability. These adhesives are high in demand due to unique features like seals with a strong & flexible bond.